Below normal temperatures seemed to want to hang tough into July as high pressure dove across the Great Lakes on the 2nd and 3rd. In addition, a warm front stalled to the south, which set up an easterly flow transporting cooler air and rain across the Corn Belt states, bringing unusually chilly conditions to the region for so late in the summer. Some record low maximum temperatures were even set during this period. Indianapolis and Dayton both broke record low maximums as they struggled to highs of 67°, more common for fall! Wilmington, OH recorded even colder numbers, whose high of 65o beat its previous record of 71o which stood since 1968. This made for a cool Fourth of July as well, staying in the 70s from Illinois to Ohio, with Columbus, OH recording its 4th coolest Fourth on record with a high of 72 degrees. The span of four days to start July became the 2nd coolest in terms of maximum temperature across the Ohio Valley for cities such as Indianapolis and Dayton, just to name a couple. Being the middle of summer, this cool snap was quickly broken as temperatures began to turn around on the 5th, with much of the remainder of the month spent at or a few degrees above average. In terms of severe weather, it was not a particularly active start to the month outside of some minor rain events dotting the region. This eventually changed as a cold front on the 6th brought strong thunderstorms to northern Illinois, resulting in wind damage. This was followed by another cold front which clipped the southern Midwest with more gusty thunderstorms on the 8th, leading to numerous reports around Cincinnati of downed trees and power lines. The largest-scale severe weather event of the month, however, came a few days later on the 13th, when a vigorous area of low pressure swung through Ontario, Canada. This low dragged a strong cold front replacing hot and humid 80s from the cooler and drier 60s and 70s. 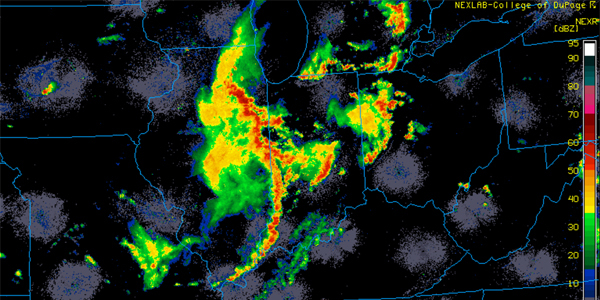 As a result, a large area of thunderstorms impacted most of the Ohio Valley region. Again, wind damage resulted from the storms, but this time, it was more widespread with gusts up to 70 mph observed in some instances. Cincinnati was a target once again as well, as a confirmed EF0 tornado touched down in nearby Bridgetown, OH. 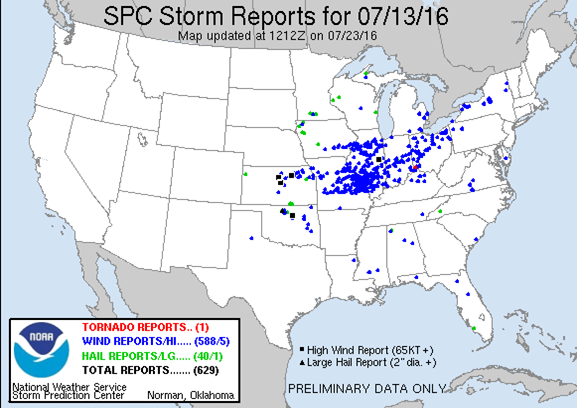 Storm reports from July 13th for the Midwest & Ohio Valley show the extent of wind damage. The next cold front rolled in on the 17th. Overall, storms were more scattered in nature with this event, but conditions were more favorable to spawn a couple of tornadoes over Northern Illinois and some hail over the south side of Chicago. These storms eventually pressed into Indiana on the 18th, bringing significant rainfall which even set a daily record at Indianapolis with 2.71”. One last significant event rolled thru the state of Illinois on the 23rd and 24th of the month, once again providing wind damage reports with even some hail in the Rockford, IL area. This marked the end of the severe weather for the month, but some significant rain did impact parts of the area on the 28th, with Cincinnati in particular getting a record amount of rain for the date with 1.46” total. So how did the Midwest do overall with rainfall totals? Well the difference from west to east was glaring. In fact, the region took on a bit of a split personality. Indianapolis acted as the center of the dividing line, separating deficits to the east and surpluses to the west. Rockford, following along with much of the rest of the state of Illinois, collected one of the highest totals in the region with 7.87”. 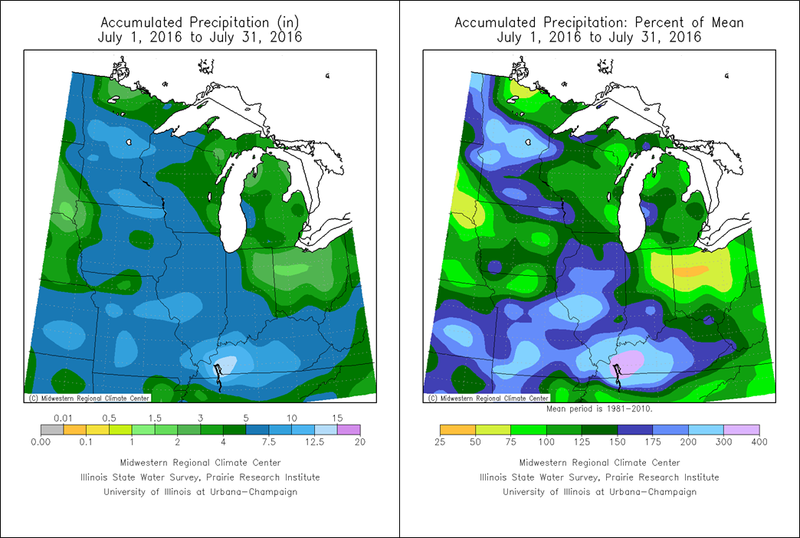 In contrast, the lack of rain was significant over most of Ohio, with Columbus one of the driest cities, only adding 2.49” to the rain gauge to the tune of a 2.20” deficit. Some parts of the state fell even further below their normal rainfall, by as much as 25 to 50 percent in some cases, resulting in a moderate drought in these spots.